IT IS VERY COOL ! ALL OF THE NUMBERS MATCH. Refinished indicator flags, new key checks, new rings, new top sign, new glass. Refinished red flash with lettering. Has both its keys and paper tape roll.hearing the ka-Ching when it opens will make you smile! The top sign is a reproduction. It is complete and the drawer opens and closes with ease. All the number keys are there but in worn original condition. Always free local pick-up. We strive to describe the item in detail and take multiple pictures, which can be enlarged. With this, we rarely have an issue with an item sent, however mistakes may happen. See pictures for details of item and condition. All numbers match. DOES NOT have keys. Recast in Red Brass. Holes are 8-1/8" from Center to Center. Polished and lacquer finisher for a long lasting shine. Weighs over 90 lbs built like a tank. Condition is Used. How it looks is how i acquired it. There are multiple "get a receipt" plans/brochure instruction Pamphlets included, i haven't been able to find anything like them yet. I'm a fan of maximizing efficiency and creating win/win deals. 1917 the lightning change maker, not sure if it works or not, some of the buttons stick when pressed. 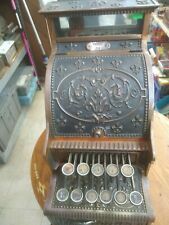 Would make a great display piece Vintage ANTIQUE Cash Register. Condition is Used. Shipped with USPS Priority Mail. 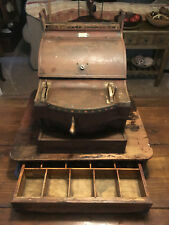 Original 1800's STAATS Cast Iron Coin Changer Bank w lit Marquee "Watch Video"
1800's Cast Iron STAATS Coin Changer SOLD - YouTube. Paste link into a browser window:[isdntekvideo]. Video will open in a new window. Important Note: The video shows a unit that has already been sold. There is paper in the scroll still. Condition: The Nickel plated finish is in very nice condition. The glass in the back where it says "CASH" has a crack. We were not able to open the drawer. We do our best to correctly represent the condition and color of each item in the photos but keep in mind monitor screen colors can differ. I took the pictures just as I found it except for the bees nest in the change drawer. I started to try to clean it up but thought you might want to see what it actually looks like when we found it. I really don't know if it's in working condition or not and have never used one of these to know where to start. Also available in Coca Cola. Inquire. The box features a cast iron base and top with two cast iron side panels and two glass panels. An ornate pattern is on the lid with a receipt slot in the center. To the side of the slot is a small lock to lock the box. #711 NCR COCA-COLA PROFESSIONALLY RESTORED CASH REGISTER MINT COND. I just finished restoring this magnificent model 711 into a Coca-Cola motif machine. coca cola top sign. lid counter. You will not find any machine redone any better. wood drawer and wood base refinished. 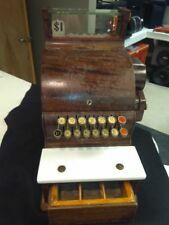 1930's Cash Register Coin Changer BANDT Junior Automatic "Watch Video"
Video will open in a new window. Paste link into a browser window:[isdntekvideo]. I included a photo from an old catalog with the tape reel installed. Really special. 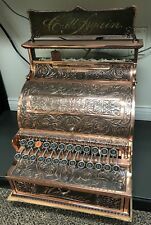 Vintage National Cash Register. Condition is Used. Do not have key, lost, did work fine before being stored. All number and sale keys are in great shape, with some grime, but can be cleaned easily, see photos for verification. Not sure what year made, serial number should provide info. Can be picked up in Fort Worth locally. Shipped with USPS Priority Mail upon request. Sell is final, no refunds or returns accepted. Indicator flags have been redone like new, new real Italian white carrara marble, new key checks, rings, glass. with 4 positions for coins and 2 for bills. Ornate Nickel-Plated. 2 Cast Ornate Panels. Locking Receipt / Ticket Box. 2 Glass Panels. OLD & ORIGINAL. 1 all original old scroll pattern complete drawer with drawer front and hardware. drawer front is 14 1/4" wide x 2 15/16 tall. width of drawer including the rails is 15". I HAD THE OLD NICKEL STRIPPED THAN I BUFFED IT. THE DUST COVER THAN WAS NICKEL PLATED. CLEANED ALL THE WINDOW PLATES. THE DUST COVER LOOKS BETTER THAN THE PICTURES SHOW. It is original and quite old, made of cast iron. My 12th image is the only example I could find. Well, this one is a little baffling. Center to center, bottom of feet sanded flat. Includes two polished. Polished, clear coated, words inked in, Holes in feet drilled 13 3/16". 1993 National Cash Register, model #2114. Great condition, works great, however it is out of ink tape because ink tape no longer made for this model. They are in great shape. They are 15 1/2" wide. Fantastic working and cosmetic condition. Rare register. Very heavy. Shipping is included in the price! The LID OVAL SAYS : MILLER BROS. in raised letters. A real Beauty.